“Umm Muslim” is an ISIS propagandist who supposedly lives in ISIS-controlled territory. She posts tweets praising “the mujahiideen,” and requests prayers for their safety. She has called for the death of the “enemies” of Muslims. 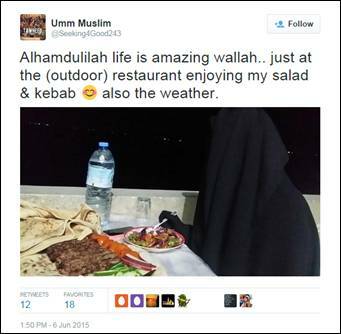 Muslim has posted several tweets glorifying life under ISIS, including high-resolution photos of herself dressed in a burka at restaurants and grocery stores. Muslim has also praised agriculture and the economy in the self-proclaimed caliphate. 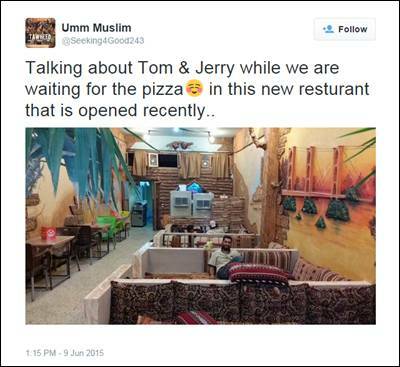 In one series of tweets showing everyday life under ISIS, Muslim recalled a discussion with her husband in a pizza store about the cartoon Tom & Jerry.Umm Muslim, Twitter, accessed July 24, 2015, https://twitter.com/Seeking4Good243. Muslim also chastises non-religious Muslims. One series of tweets in early July 2015 criticized pregnant Muslim women, particularly in the West, who do not fast during Ramadan. Healthy pregnant women have no excuse not to fast, she says.Umm Muslim, Twitter post, July 8, 2015, 3:31 p.m., https://twitter.com/Seeking4Good243/status/618910227468013568. She also questions why Muslims continue to live in the West. 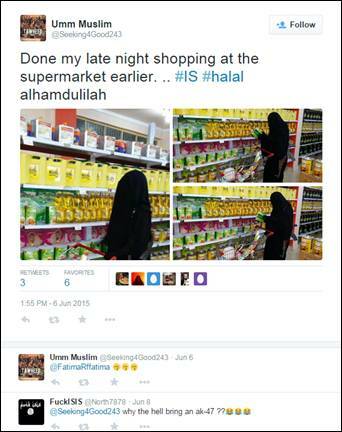 Muslim’s tweets appear aimed at presenting a normal life under ISIS to encourage Muslims to move to ISIS territory. In one tweet, she questions why Muslims continue to live in the West. In addition to tweeting about life under ISIS, Muslim regularly retweets other extremist Twitter users such as Ahmad Jibril and @FACTOFISIS. 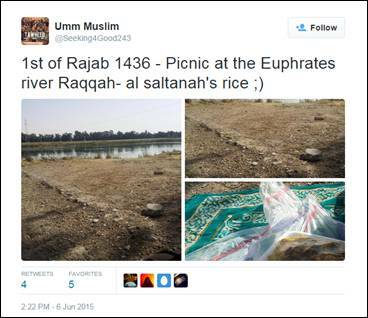 @Seeking4Good423Umm Muslim, Twitter, accessed July 24, 2015, https://twitter.com/Seeking4Good243. “Umm Muslim” is an ISIS propagandist who supposedly lives in ISIS-controlled territory. “If we are Baqiyah we do not leave social media. We stay as one. Kindly remember this bros and sis” (Tweet)Umm Muslim, Twitter post, June 3, 2015, 2:05 p.m., https://twitter.com/Seeking4Good243/status/606205019285790721. 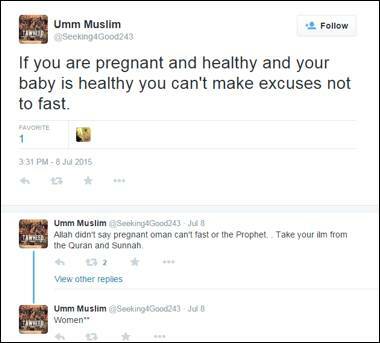 “If you are pregnant and healthy and your baby is healthy you can't make excuses not to fast.”Umm Muslim, Twitter post, July 8, 2015, 3:31 p.m., https://twitter.com/Seeking4Good243/status/618910227468013568. “Disgrace to those who show pictures of muslims suffering.. We not victims we fight back but you made your self a victim by ignoring jihad.”Umm Muslim, Twitter post, July 8, 2015, 2:19 p.m., https://twitter.com/Seeking4Good243/status/618892077619937280. “This month is the best time be a shaheed May Allah swt grant to those who yearns to be a shaheed. .Ameen ya rab”Umm Muslim, Twitter post, July 3, 2015, 2:47 p.m. https://twitter.com/Seeking4Good243/status/617087336124444672. “So give glad tidings to the Islamic state ...”Umm Muslim, Twitter post, July 2, 2015, 3:38 p.m., https://twitter.com/Seeking4Good243/status/616737847131901952. “Subhanallah so much lies have been written about the islamic state since the khalifah has been announced .. strange emmm..”Umm Muslim, Twitter post, July 2, 2015, 3:37 p.m., https://twitter.com/Seeking4Good243/status/616737578717446144. 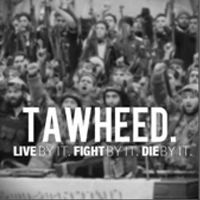 “Please keep making dua for the mujahideen and their families. .”Umm Muslim, Twitter post, June 26, 2015, 2:11 p.m., https://twitter.com/Seeking4Good243/status/614179085292601344. “Just when they thought they were winning the war. Allah swt bless victory to the mujahideen..”Umm Muslim, Twitter post, June 25, 2015, 1:42 p.m., https://twitter.com/Seeking4Good243/status/614171735831805952. “Don't you miss Allah swt and do wanna go home to Him?. I really miss Allah swt and I want to go home and be with Him.. #Jannah is calling..”Umm Muslim, Twitter post, June 21, 2015, 1:23 p.m., https://twitter.com/Seeking4Good243/status/612717404494385152. “O muslims what you still doing in the west..”Umm Muslim, Twitter post, June 18, 2015, 2:38 p.m., https://twitter.com/Seeking4Good243/status/611649120617504768. “May Allah swt bless victory to the ummah. 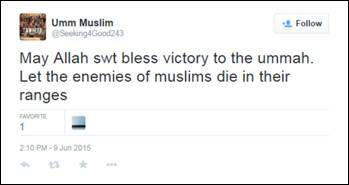 Let the enemies of muslims die in their ranges”Umm Muslim, Twitter post, June 9, 2015, 2:10 p.m., https://twitter.com/Seeking4Good243/status/608380563767107586. “Ok now let's move on to the economy in the Islamic state.. Subhanallah there is a lot of harvest this year and farms are getting more profit”Umm Muslim, Twitter post, June 9, 2015, 1:40 p.m., https://twitter.com/Seeking4Good243/status/608373115303915520. “Their parents didn't even know who Allah is or the Prophet (pbuh) subhanallah. . Thanks to democracy law.. shame on you for accepting it.”Umm Muslim, Twitter post, June 8, 2015, 1:49 p.m., https://twitter.com/Seeking4Good243/status/608012971026071552. “This is the reason why khalifah is important. . To educate the public and to protect them, to also secure their lands..”Umm Muslim, Twitter post, June 8, 2015, 1:52 p.m., https://twitter.com/Seeking4Good243/status/608013762419900416. “Mean while living in the khalifah is full of blessings u can only experience this—”Umm Muslim, Twitter post, June 6, 2015, 1:30 p.m., https://twitter.com/Seeking4Good243/status/607283346129973248. “PRT- Some brothers have issues wallahi. . Ask Allah swt to bless u with the right wives instead of asking sisters on twitter. Have patience”Umm Muslim, Twitter post, June 6, 2015, 1:15 p.m., https://twitter.com/Seeking4Good243/status/607279672397832192.